A real challenge in identifying appropriate funding is keeping on top of new calls for research funding. Some funding organisations have newsletters or use social media to let researchers know about new calls, but it is usually essential to have inside knowledge about upcoming grants, or to look regularly at the sites of those offering funding. 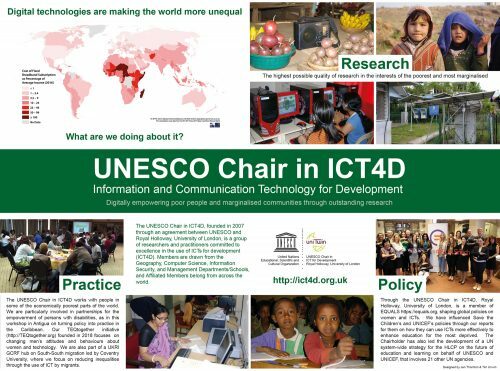 The UNESCO Chair in ICT4D hopes that the following is a useful starting point for those wishing to identify ICT4D research grants, particularly in the UK context. Please do use our contact page to share information about opportunities that are not listed below. FIRE: The Fund for Internet Research and Development – FIRE Africa – is one of Africa’s leading Grants and Awards programmes designed to encourage, support and develop innovative online solutions to Africa’s education, information, infrastructure and communication needs. UKCDR – exists to amplify the value and impact of research for global development by promoting coherence, collaboration and joint action among UK research funders.